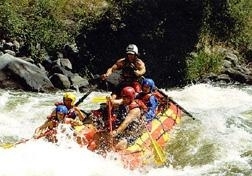 Oregon Whitewater Rafting at its Finest on the Klamath River! All Upper Klamath rafting trips launch at Spring Island boat ramp, located below John C.Boyle Dam. Trip launching times are coordinated with peak water releases from the Dam, ensuring optimal water levels and guaranteed excitement. The first 4 miles of the run consists of a few Class II & III+ rapids with mellow stretches and spectacular scenery. A true and timeless Old West allure is always present in this isolated and history rich filled canyon. Once you reach the canyon, the excitement of the "Hell's Corner" run begins with the first major rapid of the day. Caldera, a long, technical Class IV+ rapid, gets the adrenaline pumping and is followed by more than 40 thrilling (but not overwhelming) rapids intertwined with high, abrupt drops and non-stop breathtaking excitement. After having experienced some of the most exciting whitewater in the NW, we'll pull off the river approximately halfway through the Hell's Corner portion of the adventure for a wonderful and hearty gourmet lunch. High Country Expeditions is not just known for great river trips and professional guides, but also for our truly gourmet, fresh and delicious riverside meals. The meals are served right on the river bank, suited and designed to your needs by your guide. We also cater to most dietary needs and desires. After lunch it's time to get back in the saddle and ride the remaining and always exciting Upper Klamath rapids. Once out of the Canyon, you'll enjoy a 1-3 miles relaxing class 2 cool down period before the take-out. There are 3 access points to take out and these are determined by time and weather. High Country Expeditions also offers two-day rafting trips on this exciting portion of the river river.On our overnight trips, High Country Expeditions guests camp near the California/Oregon Stateline and enjoy a pleasant afternoon and evening by testing their skills at catching wild trout, swimming in the usually warm waters or just relaxing and discussing the day's run. On the second day we run the best six mile stretch again starting from the old Frain Ranch site and continuing until we reach Copco Lake. Because the water on the Upper Klamath is dam controlled, the levels are consistent throughout the summer and make this a popular late summer run. The Klamath river begins in the Cascades of southern Oregon near Klamath Falls and runs out of Klamath Lake down for approximately 17 miles into Copco Lake just south of the California-Oregon Border. Located along the Pacific Flyway, the Upper Klamath river provides habitat for an abundance of birds such as eagles, osprey, pelicans, herons and more. The Upper Klamath River carves its way through the volcanic Cascade mountain range, offering a glimpse into the Wild West of the past. Hell's Corner Canyon is full of old west flavor. High buttes crown the canyon rims, abandoned settler's cabins are visible on the banks and waterfalls and rapids are known by names like Hell's Corner, Wells Fargo, Gunsmoke, Stageline, Branding Iron, Wild Card, Jackass, Ambush and Ol' Bushwacker. 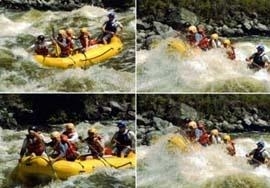 This run offers some of the most exciting whitewater rafting on the west coast! Base Full-day rate $175.00 *Discounts available! Base Two-day rate $425.00 *Discounts available! TRIP LOCATION AND CLASSIFICATION: On the Klamath River, beginning 44 miles East of Ashland, OR. This 13 to 17 mile excititng whitewater river adventurer is classified III - IV based on the International Rating Scale of I-VI. I being very mellow, easy. VI being considered by most, un-runnable. There are six rapids as class IV on this trip. TRIP CONCLUDES: In California near Copco Lake, 49 miles Southeast of Ashland, OR. After de-rigging and loading the rafts and equipment, taking a refreshment and celebration break, and changing into clothing of comfort, we return to your original rendezvous point. RESTRICTIONS/REQUIREMENTS: Good health and agility, not afraid of water, a good swimmer and at least 12 years of age (10 when accompanied by a fully informed parent) are the prerequisites. This raft trip is not for the squeamish or lighthearted. WHATS PROVIDED: All Necessary river equipment for your complete comfort and safety; fully trained, experienced and highly skilled river guides; transportation to and from your designated rendezvous point and the river; complete lunch, juice and ice water; waterproof protective bags for your camera, keys, extra clothing and personal valuables; wet suits, splash jackets and wet socks, when and if needed; our warm and friendly conversation, stories and history of the area, flora, fauna and wildlife identification, and our enthusiasm for this superstar whitewater adventure.